This range is a true expression of Estate and Terroir. 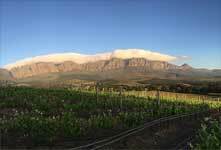 These vineyards are surrounded by spectacular mountains overlooking False Bay – sea breezes and fresh air cool down summer temperatures by up to five degrees Celsius. Rainfall figures can be hign and an eager South Easter breeze indicates a traditional European-type Terroir.